Anyone who has ever ventured down certain aisles of a Hobby Lobby knows they are full of pretend vintage decorating objects made in China. Why not buy the real thing? The cost is often similar and the real thing is just so much more… REAL! Umm, that’s better usually. Here’s a decorating scene in my living room. Everything was purchased from eBay except for the little bowl you see on the far right. I got that at a thrift shop. The antique ceiling tile from the 1890s came from an old movie theater and performing arts building called the Bijou Theatre in downtown Wausau, Wisconsin. 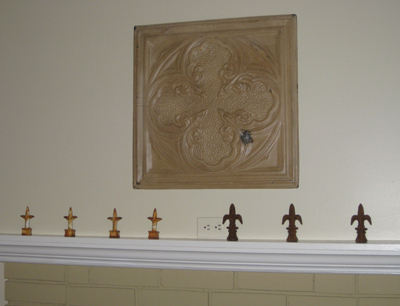 The rusty fleur de lis finials came from an estate sale in Connecticut. 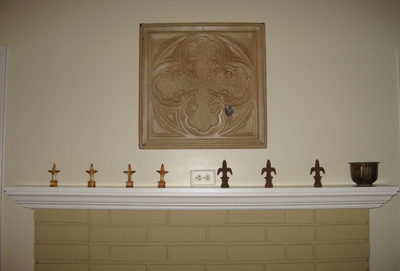 The other white finials came from an estate sale at an old barn on the coast of Oregon. No, I didn’t have to travel to these estate sales, but was able to buy all the stuff on eBay from sellers who had lots of positive feedback from previous buyers. If you want to know the story behind an item you’re thinking of buying on eBay, it never hurts to ask. Sometimes you’ll find out. For the vintage tiles, try to work with a seller who will add the wooden frame and hanger around the back for you and maybe a clear coat over the top too. Know that it’s possible that these old tiles could contain lead paint. Don’t try to strip the paint yourself unless you really know what you’re doing. The possibility of lead paint is the only downside to buying a vintage item like this versus a replica. Just use some common sense: don’t buy one with excessive peeling paint or put in a location where children can reach, and don’t sand it down yourself. Benefits of buying a vintage item are many. For example, you are supporting people who salvage items rather than throwing them all in a landfill. Many of the people selling items like vintage building materials tear them down themselves from buildings that are going to be destroyed. And you aren’t settling on some cheap-looking thing that was produced in China and made to look old. Your antique decorating items may increase in value, whereas a mass-produced item with no real charm isn’t going to get you your money back. Have you shopped for vintage decorating items at a thrift store or eBay?